Full Mouth Dental Implants Under IV Sedation or Twilight Anesthesia? Dr. Adams enjoys changing his patients lives with full mouth dental implant options. “We are lucky because with todays technology, we can replace all teeth with dental implants in a single comfortable implant sedation visit.” Dr Adams has been replacing teeth with dental implants for over 15 years. Most patients can tolerate removing and replacing one tooth while being awake. 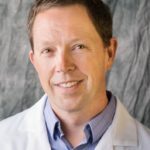 But, Dr Adams believes most people will do better during the full mouth implant procedure and heal better when the procedure is done with IV sedation dentistry. Call us today for a no cost full mouth consultation. Should You Replace All Teeth with Implants? How much you value keeping your natural teeth if that is possible. How long you want your dental solution to last. How much you can afford to spend on implants and fixing your teeth. Cost considerations. How much does a full mouth of dental implants cost. What are my other options to replace a full set of teeth? Maybe you can fix your natural teeth and replacing them with implants is not your best option. How much does it cost to save your teeth vs how much for dental implants and how long will the different solutions last? How to replace all teeth with full mouth implants? Basically we remove your bad teeth and replace them with 20-30 implanted teeth. The tooth Implants serve as new roots that can anchor new and beautiful zirconia and porcelain crowns. Implant crowns can be brushed and flossed just like natural teeth. Implants are not susceptible to common dental problems like cavities, root canals and gum disease. The implanted teeth are small and similar in size to natural teeth. The teeth do not feel thick and unnatural like bridges or dentures. Depending on how long you have been missing teeth and the condition of your remaining teeth, a full mouth of implants may not be the best option. Many people can have gum and bone loss and need gum height replaced in addition to teeth. If gum and bone need to be replaced a full mouth all on 4 solution may be a better. 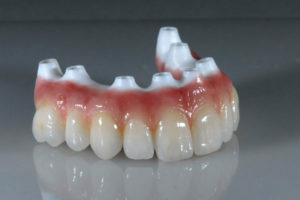 All on 4 implant bridges include replacement of gum and teeth. Should you get All on 4 or Full Mouth Dental Implant Sedation? 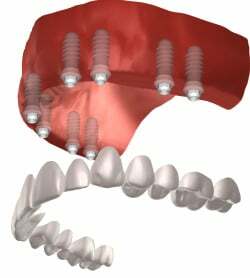 Full mouth dental implant sedation and individual crowns is far more expensive because it requires several more implants. Individual crowns and abutments are more expensive than the all on 4 bridge also. Precise placement of 10 implants in one jaw is more difficult than 4 and the procedure requires a more skilled implant dentist and more surgical time. In cases where a lot of gum and bone height has been lost, a full mouth of individual implants may not be possible. Cases with a full jaw of bad teeth and very little gum loss will receive the highest level of patient satisfaction and the best result with a full mouth of implants and individual crowns. Is Sedation Necessary for Full Mouth Implants? Should you do full mouth dental implant sedation? Why not you are already spending a lot of money? Seriously, sedation is not necessary, but full mouth cases no matter the solution can take a lot of implant surgical time and they can be annoying to sit through. 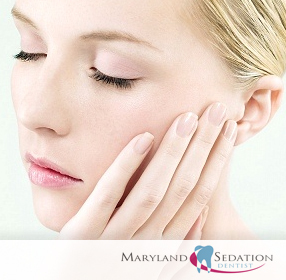 Sedation for implants allows you to remain relaxed. Patients who do not receive sedation will experience some degree of discomfort and enter into a “fight or flight” response. The fight flight response results in systemic inflammation, more post operative pain and can result in poor treatment outcomes such as implant failure. The most important thing is for the patient to remain calm and comfortable throughout the procedure.